Doritos really are favourite corn chips to eat and we love cheese supreme corn chips in all packet sizes from little individual packs to share packs. I think these are my favourite Doritos flavour. They are good to have on their own. The flavour is great and I prefer not to have anything with them. We love these chips in our home, great for snacks and they taste amazing. My kids love them and we divide them into snack size packs for lunches. Doritos cheese supreme corn chips are full of cheese flavour and they are brilliant by themselves,with dips or to make nacho’s.A great brand to buy. We cannot have Doritos open for more than 5 minutes in our house! They get gobbled up very quickly! Great with a dip whilst entertaining, or watching TV. We also have these as part of our meals, i.e. Chilli Con Carne or Nachos. Big hit with my family. These Doritos Corn Chips Cheese Supreme have so much flavour they and so much taste that they are perfect all on their own; they are however also very very good as a nachos meal. I cant do 5 stars on my phone but i would if i could. Why are we even rating this? These chips are delishous and do have a perfect crunch and a delicious flavour. 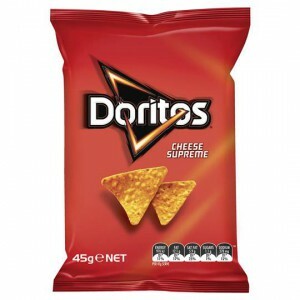 Of all the Doritos flavours, cheese supreme is my favourite. Each corn chip is full of flavour and it is hard to stop eating them – they are so moreish. How would you rate Doritos Corn Chips Cheese Supreme?